Guitarist and artist Henry Worrall moved to Topeka, Kansas, in 1868 and died there in 1902. 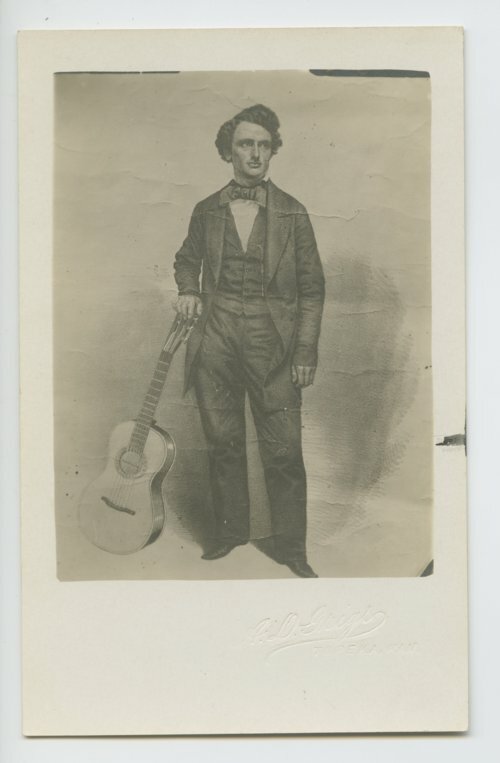 This photograph shows a youthful Worrall standing with his guitar. The photo was probably taken during Worrall's residence in Ohio in the 1850s or 1860s and reproduced later in Topeka by A. D. Griggs, as the border bears his imprint. Worrall's celebrated solo guitar instrumentals "Sebastopol" and "Violet Waltz" enjoyed great popularity in the nineteenth century. In the early twentieth century, Worrall's popular solo guitar pieces played a key role in the development of the guitar styles of southern rural folk musicians and country and blues musical idioms.